To me nothing says “Spring” better than my box turtle, Spider, waking up from his long, winter torpor. 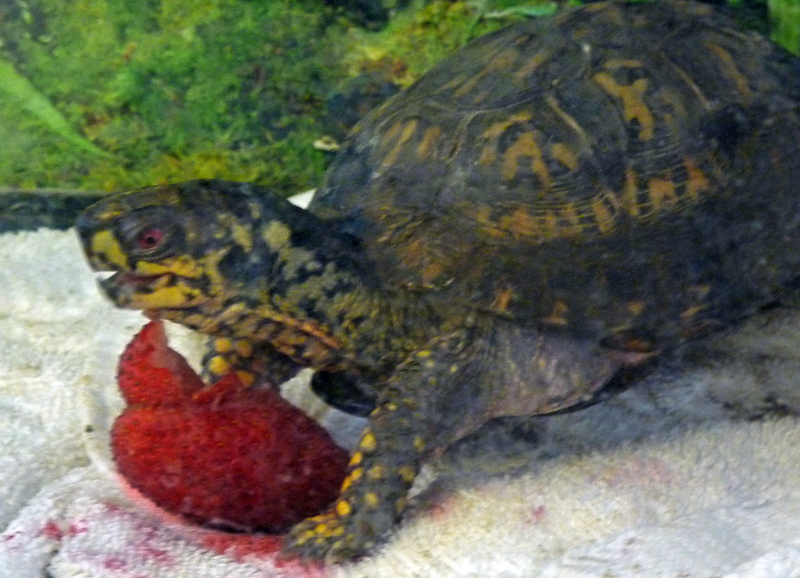 Here is a picture that Deborah took of Spider savoring a strawberry. As soon as we get a real “worm moon” (maybe this Friday night? ), I will add some nightcrawlers to his menu! My front yard is really starting to come into Spring this week. The crocuses are blooming in the warmed microenvironment next to the brick front of my house. They open on the sunny “warmer” days and close up at night and during the (more frequent) “cooler” days. Crocuses, like most of the early spring plants, have built-in protections against freezing. Their high sugar content can reduce the freezing points of their tissue fluids to as low as 20 degrees F, and special antifreeze proteins (like the ones I talked about in the snow fleas in a previous blog!) block the connections between the freezing water crystals. The male cardinals have joined the male titmice and white-throated sparrows in a morning display chorus (the Carolina wrens have been singing all winter!). When I go out in the morning to fill the bird feeders their songs swirl all around me (telling me, I am sure, to hurry up and get the feeders loaded up!). Last week, Deborah and I spent a few days up at State College for some meetings and a conference, and I was fortunate to find a few hours to visit the Arboretum at Penn State. The arboretum is on the north side of the Penn State University Park Campus across Park Avenue next to the new Law School building. This facility has been in the planning stages since the mid-1990’s but its initial component, The H.O.Smith Botanic Gardens, officially opened in 2010. 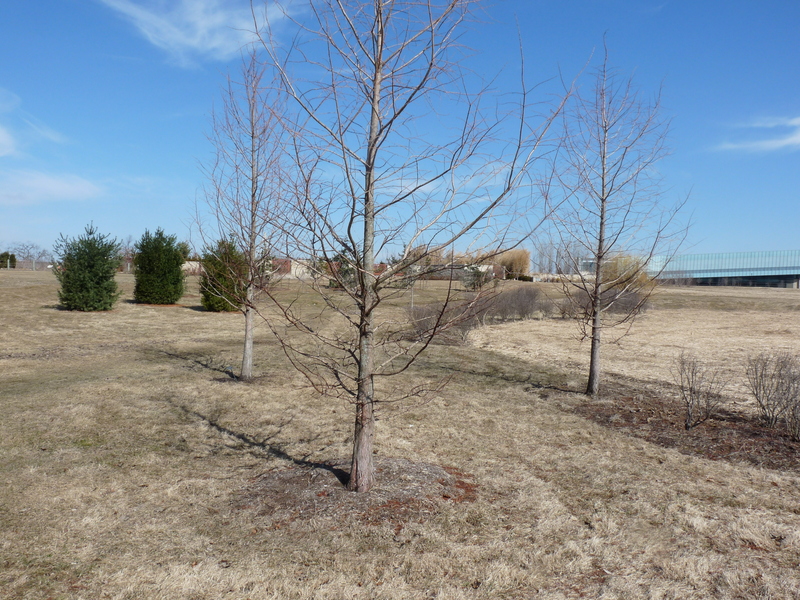 The total area of the arboretum is 370 acres and includes open fields, established woods, and many recently planted species of trees, shrubs, and garden plants. Most of the trees are, of course, quite small (mostly 5 to 6 inches in trunk diameter and at most 8 to 12 feet tall). A notable exception to this young array of trees is the almost 50 year old white oak (not pictured – it is called the “Hosler Oak”) that was transplanted from its original Lancaster County location in spectacular style (with the help of a 50-ton crane) in 2005. The overall appearance of the arboretum, then, is very open and at first glance almost empty, but the quality and future of the place is obvious once you start to look around. The circular walking path of the Smith Botanical Garden is ringed with a nearly continuous planting of Western Red Cedar. Stepping through one of the many openings to the path you feel the functionality of the coniferous windbreak around you. There are over 17,000 individual plants of 700 different species in the arboretum. Many of them, of course, are not terribly obvious here on the cusp of the waning winter. The many deciduous trees are bare of leaves or flowers and with the exception of some hardy daffodil tips, most of the herbaceous plants are still hidden underground. The evergreen conifers, though, looked green and wonderful! There were species of pines, firs, spruces, and junipers from all around the world. The subtle variations in their needle patterns and colors and their incredible varieties of growth forms were fascinating to look at. Their contribution of “green” to this cold, windy day was most appreciated. 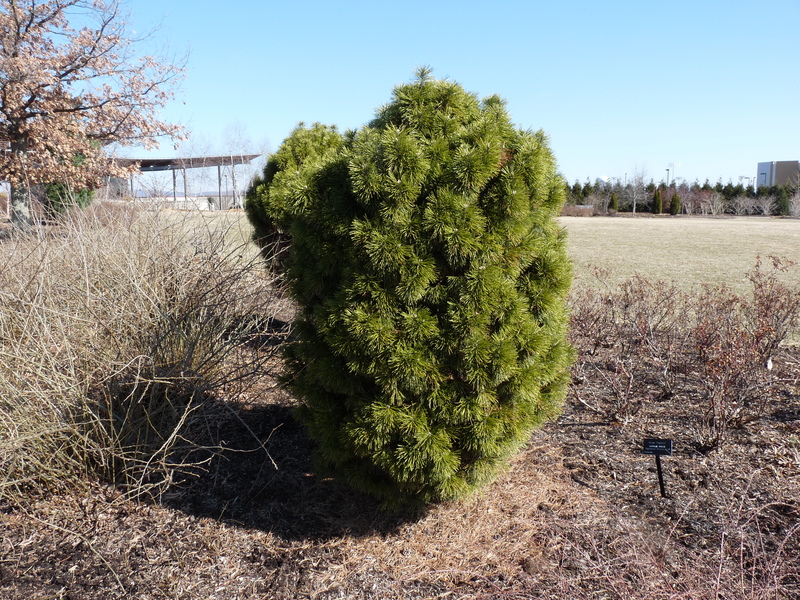 The drooping Alaska cedar, the round, low Bosnian pine, the bulbous almost glandular looking Mugo pine (pictured above), and the long branched, sparsely needled limber pine (and so many more!) kept my mind away from the cold temperatures and the steadily blowing wind. 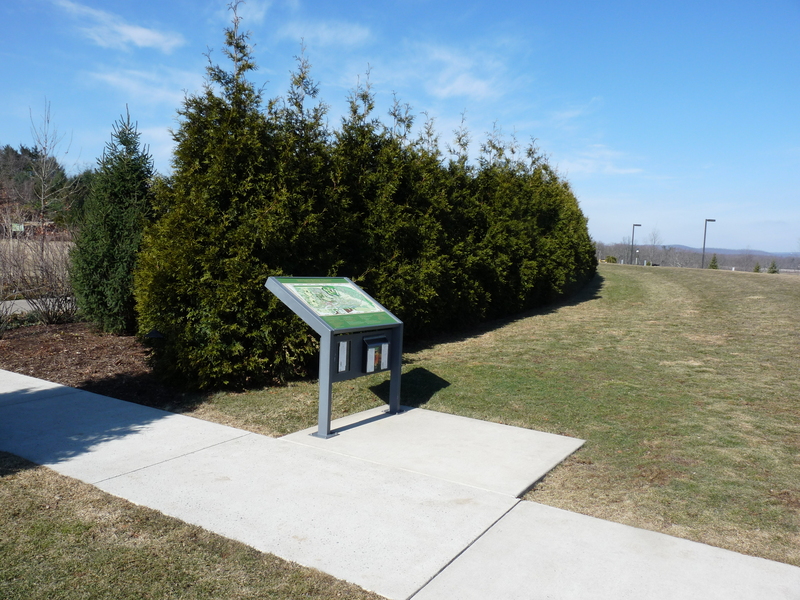 The southeast side of the arboretum that borders on East Park Avenue is a large, bowl-shaped meadow called the “Ramage Marsh Meadow.” It is named after Jim and Lynn Ramage of Ford Cliff, PA who are great supporters of both University Park ventures and also our own New Kensington Campus. The marsh meadow is designed to gather the surface run-off water that had once flowed freely down the gentle slope of the Big Hollow valley in which the arboretum and the surrounding neighborhoods and campus buildings sit and hold it so that it can percolate down into the underlying aquifer. The soil of the meadow is dry and firm most of the time, and its grasses, ringed by red-stemmed dogwood, willows, and other moisture loving trees and shrubs, move in attractive swirling patterns with the passing breezes. The graduating class of 2010 donated a boardwalk that bisects the center of the meadow. Views north and south from the walkway give you the feel of a very unexpected prairie-like ecosystem. My favorite part of the Ramage Marsh Meadow, though, was the cluster of dawn redwoods planted on the northern border. The dawn redwood is a deciduous conifer so the trees were bereft of needles, but it was wonderful seeing these “living fossils” growing so well in Pennsylvania. Prior to the 1940’s dawn redwoods were only known from their very extensive, 65 million year old fossils! Finding living specimens of these trees growing in small, remote clusters in the mountains of China was the dendrological equivalent of finding a mastodon or Tyrannosaurus rex living in some isolated canyon or mountain range. These dawn redwoods may grow to over 200 feet tall and in their prime will make a dramatic entry point into the meadow. We’ll have to come back in 2114 to see how they have fared! The look and feel of the Penn State Arboretum is of a place that is beginning. Last summer I visited a botanical garden and arboretum in Basil Switzerland that dated back to 1589! Among their very mature trees they even had a 110 year old giant sequoia (over 100 feet tall) that they had brought from California. It towered over the lush elms and willows and horse chestnut trees of the garden. The mature, “finished” feel to these Swiss gardens, I am sure, will be the eventual outcome of this new arboretum. Will tonight be the rising of the earthworms? I will let you know next week!